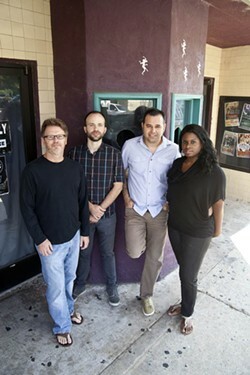 PROMO SHOT: Gregg McCraw, Bo White, Tony Arreaza and Sa-Idah Harley gather outside the Neighborhood Theatre. The pieces of a music scene go together like computer components — different parts and mechanisms of various sizes that function together to make an entire unit work. 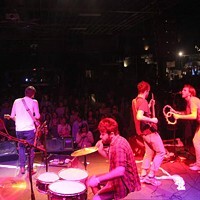 Just as there are venues large and small and performers of broad notoriety, there are also promoters who work tirelessly to showcase each niche in the larger picture. While the economic downturn in recent years has affected the music industry across the board, most would agree things appear to be turning around and improving in Charlotte. People are going out to more venues for a broader range of shows. 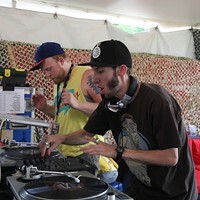 Among those who are working hard to promote Charlotte's scene is Mindelixir, whose Bass Church events at various venues around town — currently at the Fillmore — boost the electronic side of the city's soundscape. Bo White, a local musician who also runs the indie record label Kinnikinnik, has been instrumental in showcasing more avant-rock artists and musicians through the label and exclusive house concerts. Tony Arreaza infuses more Latin music into the mainstream, thanks to his work with the Latin American Coalition and his production company Carlotan Rock. Sa-Idah Harley started the Sai Musiq Jazz Series in an effort to spotlight local artists as well as bring more authentic jazz to town. Under the MaxxMusic name, Gregg McCraw works with venues of all sizes to bring performers — both new (Dawes) and familiar (Neko Case) — to town and help them build a local fan base. As The Sol Kitchen, Mike Kitchen brings acts that haven't been to Charlotte in years, and those on the verge of making it big.